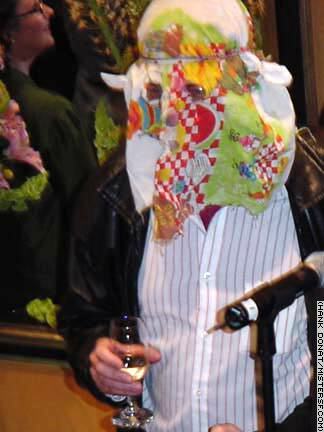 Only in San Francisco can a man named Strange who wears a pillow case over his head to public events become a popular figure on the social register. Strange de Jim was first quoted in Herb Caen's column on September 17, 1972 when he wrote Caen, "Since I didn't believe in reincarnation in any of my other lives, why should I have to believe in it in this one?" From that day he was quoted more than 300 times by Caen, though it was 15 years before Caen knew the identity of the man whose wit he shared in the pages of the Chronicle. When Caen died in 1997, Strange removed his pillow case at a memorial service for the columnist and announced he'd changed his name to Just Plain Strange. After Caen's death it was also learned that Strange is a graduate of Columbia University, West Virginia native and Castro district resident in his late 50s who lives with his partner, Martin. Until recently Strange wrote a weekly Internet column under his new name, but has also returned to his disguise and to his original nom de plume. With most folks still in the dark as to the man behind the sham, Strange continues to contribute bon mots to local scribes. He is also the author of two books, Visioning and The Strange Experience. A couple of typical Strangisms on fine dining from the Caen days: "I won't eat snails - I prefer fast food," and "This mushroom soup tastes like shiitake." From Heart of the City 08/05/03: "After wearing a pillow case in public for decades, Herb Caen's favorite corespondent, Strange de Jim, was introduced in the lobby of the Marines Memorial on Sutter Street sans sac. It seems de Jim, one of the city's sharpest wits, is openly strange."